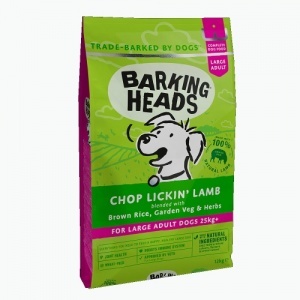 Barking Heads Large Breed lamb is a delicious and healthy complete large breed dog food. Contains 50% Lamb - a single animal protein source. Optimal levels of Omega 6 and Omega 3 with Joint and hip care plus for healthy joints. Lamb is a fantastic source of protein and benefits healthy skin, shiny coats and good hip and joint care. Large Breed lamb also helps to alleviate itching and excess shedding, and the oats benefit organs and digestion as well as helping to keep cholesterol low. It also contains a little trout because it’s low in saturated fats and high in Omega-3 essential fatty acids for joint protection and mobility. Big Foot Bad Hair Day is delicious and full of nutritious healthy ingredients.